Quick, reliable and cost-effective detection of combustible gases and vapors in ambient air: the microprocessor-based Polytron 5310 transmitter is the result of more than 40 years of experience in measurement technology and contains a durable, poison-resistant IR sensor. 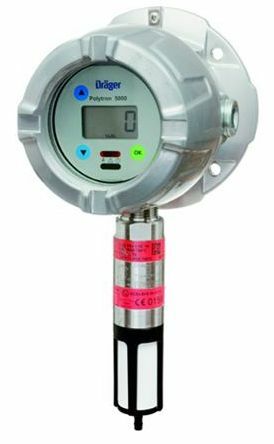 Drager has been developing and manufacturing sensors and gas detectors for industrial use for more than 40 years. And with each new device generation, we drive our measurement technology a bit further. Upon request, the Drager Polytron 5310 can be supplied with three integrated relays. This enables you to use it as an independent gas detection system with two arbitrarily adjustable concentration alarms and one fault alarm. Audio alarms, signal lights, or similar devices can, thus, be controlled locally - without an additional cable between the transmitter and a central controller. The sensor signal can be evaluated using the 4 to 20 mA signal. The housing has four mounting holes. Two different mounting sets are available for installing the Polytron 5310: a duct-mount and a pipe mount set. This means that the transmitter can be easily installed anywhere - e.g., on a smooth wall, a pipe or an exhaust duct. The electronics and the bezel form a single unit. Simply pull them out of the housing. Then insert the three-wire cable into the terminals - either through the Ex-e cable gland or through the seal on the conduit. Finally, plug the terminal block into the PCB.